So let's dive into one of the packages I received recently. Rob runs the great blog Texas Rangers cards. I love reading his short bu informative posts about cards in his collection. It doesn't matter if none are about my team - it's great to just learn about those players that never became the household name, but still had an impact on the game. This is the 2nd package I have received from Rob out of the blue. I love out of the blue packages. Hey wait...... Rangers......blue. ILLUMINATI!!!! Reign it in, Jeff. You'll be ok. Just show off some of the awesome cards Rob sent. 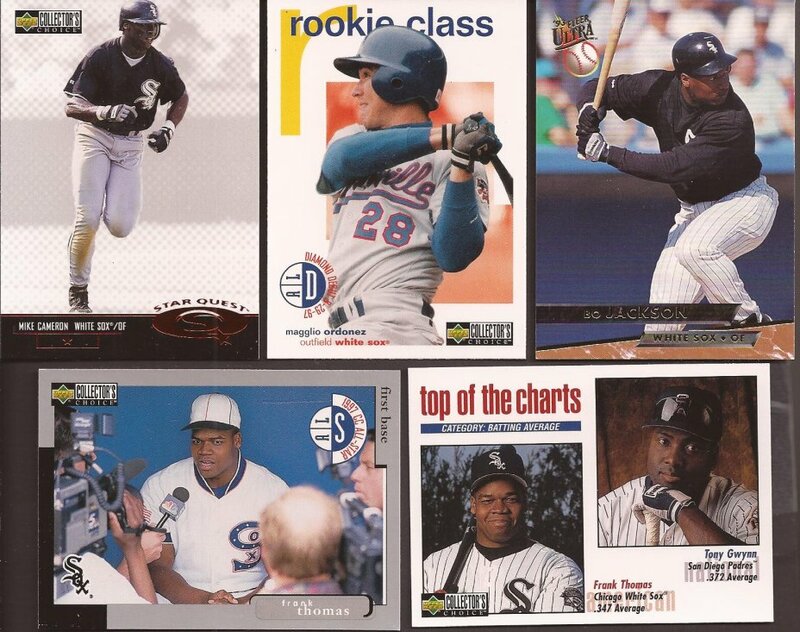 Rob hit on a lot of years for the Sox box. You got your current year releases. Double LaRoche there. I do hope he bounces back and isn't the second coming of Adam Dunn on the south side. The Garcia is a dupe for the team set, but holy cow that is one gorgeous card. Made it into another binder I will be talking about in the near future. 1993. Went to a Sox game early in the year, but it got rained out, so I had to redeem the vouchers for a game. The date I happened to select - Sept 27th. The Sox were battling for the division that year and the magic number was 1 when that day came by. Seats in the upper deck, first base line. Sixth inning, Bo comes up and hits a towering fly ball. It's a mile in the air and it carries........and carries.....and carries......j-u-s-t over the left field wall to put the Sox in the lead to clinch the division that game. So glad the earlier game was rained out. How about some vintage-ish cards too? Rob dropped a dang near complete team set for the 2008 & 2012 Heritage releases. I just needed a couple of the 2012, but almost all of the 2008. 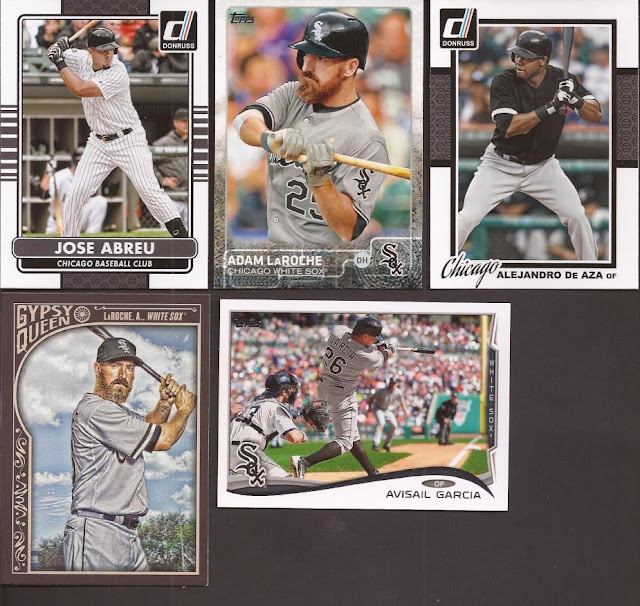 And the few A&G within also found spots in the Sox box. My two favs from the package. Another shot of those gorgeous Sunday throwbacks to the 1917 World Series uniforms. 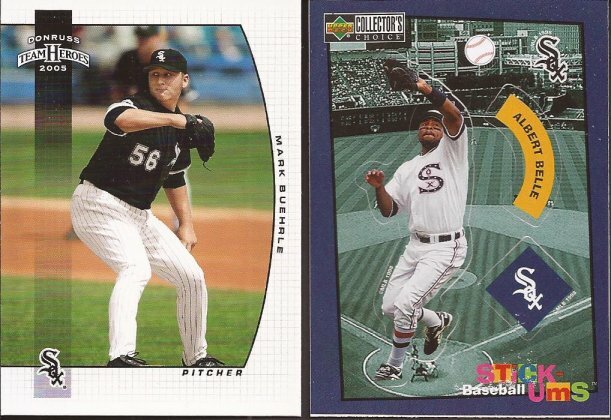 And I will take each any every Buehrle out there. I do hope Mark comes back to Comiskey as a White Sox, if only for a one day contract to retire. Rob - thanks for the cardboard. I'm working on a return package... just cuz. Bo was a beast. It's nice to see his cards show up on the blogosphere. That's awesome I've been to playoff games but never a clinching game. Here's to both of us watching one next year.